Adopted Shelties - Where Are They Now? 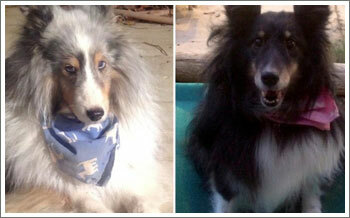 With joy, we share the stories of our placed Sheltiesâ€¦.each one has found their "furever" home! Tuxedo has found his forever home! 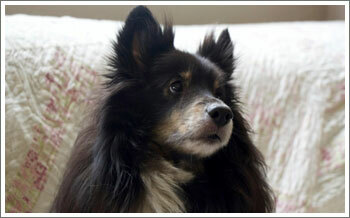 He is a calm, laid back, beautiful 12 yr old bi-black Sheltie that loves everyone. Tux's new family will continue to work with him to get his weight down...we're sure lots of snuggles will be involved! It takes a special kind of angel to adopt a senior dog, so big hugs to Tux's new family! We are thrilled for all of you! Courtesy Listing (Chihuahua Rescue San Diego) - Introducing Barnie! 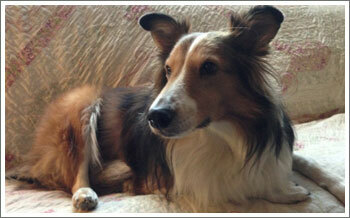 We are happy to report that Barnie, a 6 year old sheltie mix, has been adopted. Congratulations to Barnie and his new family! Our girl Sweetie will be heading to her new home this week...a home with other Shelties and a family that will love and cherish her through the rest of her golden years! Puppy hugs to all! Reef has been adopted and is settling in to his new home in San Diego. His new home came pre-populated with a brother! We are thrilled for Reef and his new family. Puppy hugs to all! Farmer has been adopted by a family with a loooooooong history of loving Shelites. Farmer is a wonderful, friendly, house trained, eight year old little boy that came in with his brother. Although he and his brother get into scapes occasionally, this family wanted them both and they have the experience to keep the boys in line. 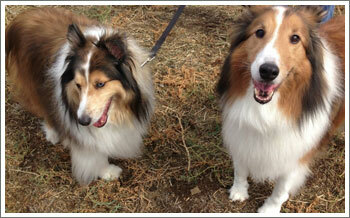 Congrats to Farmer, his brother and this long time Sheltie-loving family! Our boy River is a sweet ten year old, who acts younger than his years. He is neutered, totally house trained, walks well on lead, and is very friendly and loving. River is on a medication for allergies but is otherwise healthy. He would do well with one other dog or could be an only dog as he loves his people and enjoys spending time sitting with them. River is eager to go on walks and enjoys playing chase with one of our dogs. This little fellow will complete any home and bring happiness to those around him. Happy Family Day! SSRI is super pleased to be able to share an update on these lovely little girls. A previous SSRI adopter was able to keep the girls together and they have happily settled in to their new forever home! Congrats to the lucky ladies AND their new family! Happy adoption day to me! My name is Angel; I'm an 8 year old Blue Merle but act more like I'm 3 and I found my new, furever home! There are lots of young people to play with and they will take me for walks and hikes and pet me and love me always! Congratulations to Angel and her new family! Pupdate! 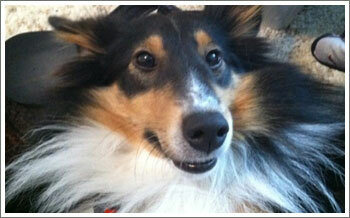 (Shamelessly stealing the tagline from Minnesota Sheltie Rescue) Chief has been adopted!!! A previous SSRI adopter met with Chief and his trainer and it was love at first site...that love remained strong through some initial parent/dog/trainer training sessions and Chief went home with his new family. Congrats and warm puppy hugs to the family and to our boy Chief! Milo has found his new furever home AND a new brother named Ollie (also an SSRI rescue)! Milo and Ollie have aleady been out on walks together and found they can comfortably share their humans' bed. Milo even got a new tag - look at that smile! We are thrilled for Milo and his new family! Dash has found his new furever home! Dash is 8 years old, loves traveling, going for a walk, or just relaxing at home - as long as he is with his family! Dash thinks kitties are fun for chasing and so are ducks, but no harm will come to them; he is just a curious boy. He LOVES a warm blanket when it's cold outside and will wander around the house looking like a little ghost whilst he wears the blanket. We are thrilled for Dash and his new family! Hello, hello, hello!! 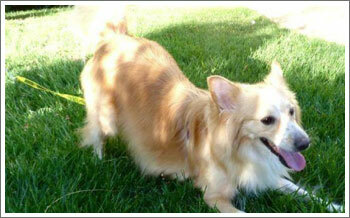 My name is Juliette and I am a Pom/Sheltie mix girl that needs a forever home. I was found in a shelter when my foster mom went to see another dog and she couldnâ€™t pass me up. I am seven years old, weigh about 15 pounds, and already spayed, house trained to a dog door, good around other dogs and people, am on a diet because I am a little overweight, have a loving personality plus being very, very beautiful. I just need a chance to show my new family what a good girl I am. My foster dad took this picture of me in front of a sheltie statue so you could see how much I am marked like a sable sheltie so if you think I would fit into your home, please call Southland Sheltie Rescue and ask for Juliette. 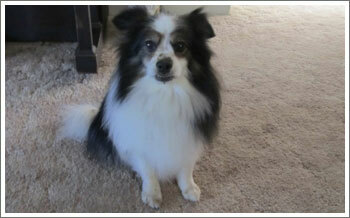 Henry is a 7 year old, neutered male, sable and white Sheltie. Before his owner passed away in December, she asked that we find him a new loving home. He is a very sweet and loving boy. Loves to sleep in bed with you, or on the floor next to you, in a soft doggie bed. Henry gets along well with other dogs. We have not seen him around cats, however with his sweet temperament we believe he will do just fine. 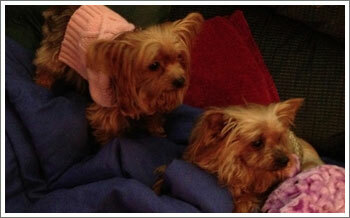 Cookie (15) and Delilah (9) are a bonded pair of Yorkshire Terriers, who are mother and daughter. The girls were adopted by a family that has the love and experience to help them transition to their new home. We look forward to seeing them again at our next picnic or in a future newsletter story. Adopted together! 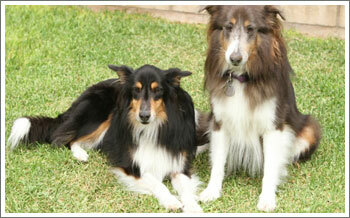 Missy and Molly are two sheltie-border collie mixes that we have taken into rescue. Missy is three and a half and Molly is one year old, both are spayed, current on shots, house trained, walk on leash and are friendly, loving dogs. Molly is Missyâ€™s puppy and they are very bonded â€“ they sleep together, eat together, curl up together and are very attached to each other. Missy is very jealous and protective of Molly around other dogs so these two need to be the only dogs in a home. 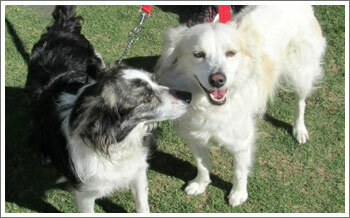 Both dogs are quite smart, easy to train and would make wonderful companions for a family looking for two lovely girls. 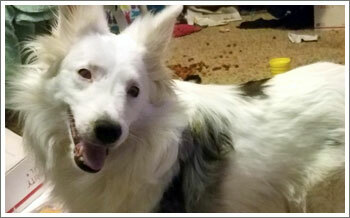 My name is Patches and I am a double merle sheltie â€“ I am also blind and partially deaf due to birth defects from breeding two merle shelties. I was rescued by a wonderful lady who saved me and six puppies from certain death at the hands of a misguided person. This lady has placed all of the puppies and now I need a home of my own. I will need someone very special who can understand my difficulties and recognize that with time, patience and love I can overcome these disabilities. I now live on a ranch and can go anywhere, including the horse barn, as I have the area mapped out in my head. I am spayed, house trained, have learned a few signals from my foster mom, am very loving and would like the chance to be a special dog to someone kind and wise enough to recognize my potential. 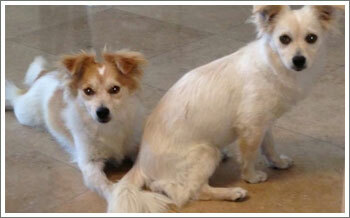 Vanna and Chloe are best friends that have lived together their whole lives and would like to be adopted together. They are both smaller sized, spayed females, 9 and 10 years old and full of life. Vanna is white factored, Chloe is tricolored and requires special food. They have had excellent medical care and just had their teeth fully cleaned. They came to rescue because their humans have caretakers who are not able to also take care of the dogs. As older dogs, the only special accommodations they need are potty reminders and easy access to their potty yard. 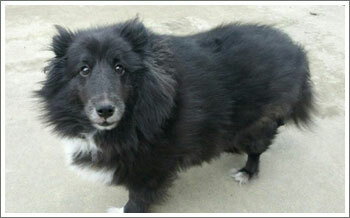 Hello, my name is Sweetie and as you can see, I am not a sheltie but I am looking for a forever home. I was living in a car with two other dogs but when my person found a place to live, they would only take two of her dogs so the shelties said I could stay with them for awhile. I am very cute, loving, friendly with other dogs, good with kids and would love to be your best friend. I weigh 11 pounds so I could be a lap dog, am a good watch dog and really need my own home. 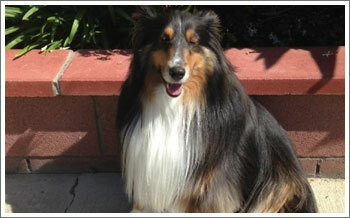 Please contact Southland Sheltie Rescue if you think I would be a good fit for your home. 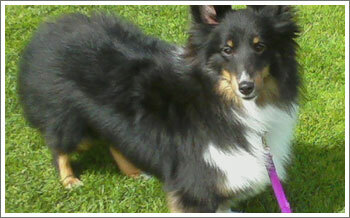 Bella Joy is a very beautiful three year old Tri Color sheltie with lots of personality and great fun to have around. She is a little nervous when meeting strangers but warms up quite quickly. She is crate trained, sits, downs, retrieves balls and toys, walks on lead and is mostly house trained. She will need ongoing help with potty training. Bella gets along with most dogs but would do best with one dog, probably a male who would play with her, is a little possessive of her food and needs to lose a little weight. She greets everyone at the door with a bark but quiets down quickly. 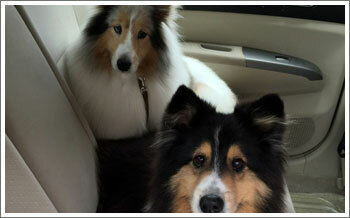 Bear and Bella are a bonded pair of shelties who came into rescue about a month ago. They are six years old and under medical care at this time due to extreme hair loss, but as you can see, their coats are coming back beautifully. They are scheduled for medicated baths twice a week for the next two months ,enjoy going to the groomer and are feeling much better. 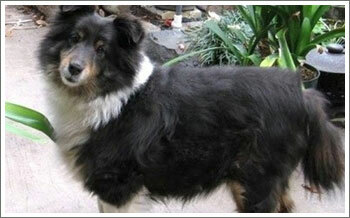 Leo is a nine year old small sheltie looking for a forever home as his owners moved and could not take him. He is nervous around new people but gets along with other dogs very well. He is under medical care for an ear infection that is clearing up nicely, had his teeth cleaned, been checked by our vet and is ready to go to a new home. Leo is house trained, does some tricks and is still a little confused as to what has happened to him, but is coming around slowly. This little boy needs someone to take time with him, give him the reassurance he is looking for and be there to watch him become the loving companion that we all know he can be. Teddy is an 8yr. 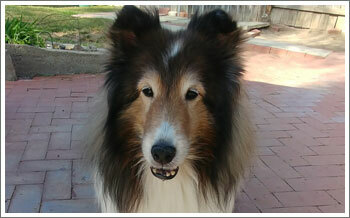 old, sable, male Sheltie. 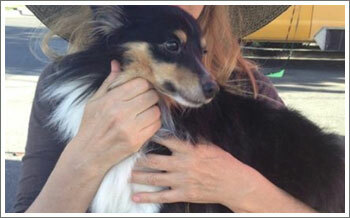 His owners surrendered him to Southland Sheltie Rescue because they moved. He loves toys and is very playful and happy. He gets along with other dogs, but does not like cats. Teddy needs a home where he will get a lot of attention and love. Preferably a home where someone is home a lot. Heâ€™ll do best with children over 12. He had a stone in his urethra that was removed surgically about 4yrs. ago and because of this he needs to be on a prescription diet for the rest of his life. He loves his food and does very well on it. He also has some arthritis in his right front foot and is on medication for that as well. He loves to go for walks. Heâ€™s a lovely boy and would love to have his own home with a loving family. 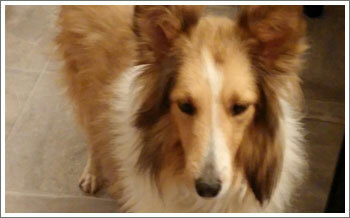 Acacia is a beautiful, 4 year old, sable and white, female Sheltie. Her earlier life was extremely confined, and she did not get to run or play. She is making up for that now!! Because she was not allowed outside, she was never house trained, and was used to using the floor as her potty area. We have been diligent with teaching her to go outside, to use the potty as well as learning to play and enjoy the outdoors. She has taken to this very quickly and now loves to be outside and to play with balls and toys! She has not made any mistakes in the house for several weeks, but she will need a home with a back yard and easy access to the outdoors. She is a very quick learner and wants to please, so I do not think that it will take much to have her totally potty trained. Hi, my name is Gwennie. 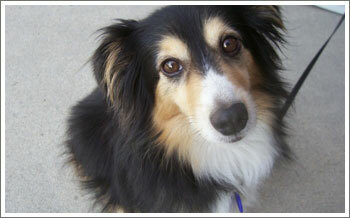 I am 4 years old, about 30 lbs., a spayed female Sheltie mix. I like people, am very friendly, definitely happy and I like toys. I am looking for a home where I can be the one and only dog, the center of attention. Other dogs do not appreciate me and I do not particularly get along with them either, they just do not get it. I was on the street for a long time and someone finally took me to the shelter where Sheltie Rescue came and told me everything was going to be OKAY. They think that maybe I might be a Sheltie & Corgi mix. I would love to live with you and be spoiled by you. Wonâ€™t you consider taking me home? Zippy is a stunning 15 year old gentleman blue merle Sheltie with two sparkling blue eyes (typical of a Blue Merle), who is very loving and gentle. 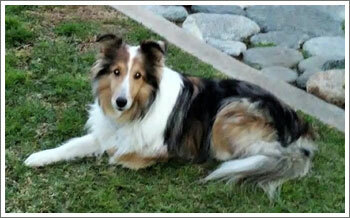 Zelly is a darling 7 1/2 year old tricolor Sheltie girl who is a total sweetheart. Her thyroid is low and she is on medication for that, and otherwise healthy. Both Zippy and Zelly are active, happy, social, and friendly. Both pets are spayed and neutered, and current on vaccinations, however they are both a bit overweight and need to be on measured meals in order for them to remain healthy. It would be nice for them to be placed together. 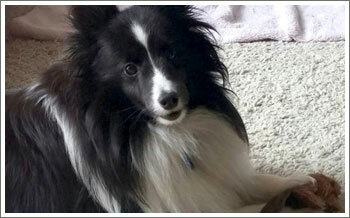 Handsome Kuro, which means â€œBlackâ€ in Japanese, will make some lucky adopter a perfect companion. Kuro is very sweet, smart, friendly, and potty trained. He has been in a loving home, living with an elder 89 year old widower whom has terminal cancer. He loves his current home and will need time to adjust when first adopted. He follows his owner everywhere she goes, following just steps behind her. Kuro only barks when he hears sounds that are unknown to him or when guests arrive or leave. He will let you know when he needs to go outside as he is house trained, by barking. He loves his many beds and toys. Kuro has been given too many treats and human food as such he is overweight. He is 6 years old, weighs 35 lbs and is 13 inches tall to the body. 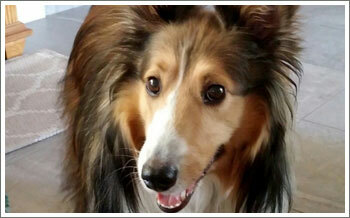 Beau Louis is a beautiful, 4 years old, neutered male, sable and white Sheltie. 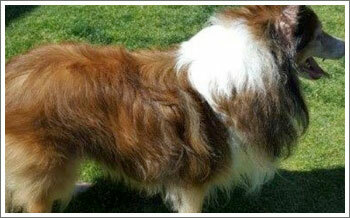 At about 18 inches at the shoulder and 45 pounds, he is larger than a standard Sheltie. He was given up by his family because they could no longer care for him. He is playful, happy and very friendly to people and dogs. He has never been around cats so we do not know how he would react. He is house trained, up to date on shots, neutered and healthy. 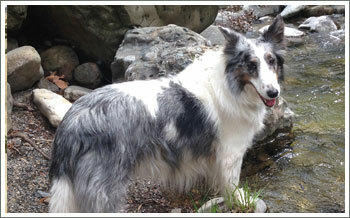 Cheyanne is a bright and spry, 9 years young, blue merle, female Sheltie. She is sweet and attentive, her personality and joy for life is wonderful. She loves to hang out with her people and do whatever the family is doing. Sometimes she will play with other dogs but she prefers people. Her coat is growing out, it has been a joy to watch her transform into such a beauty. She has a food allergy to white fish so she is on a limited ingredient diet with no fish or products that contain fish oil. If you are looking for a spirited girl to share your life with, Cheyanne is a wonderful companion. She is spayed, microchipped and up to date on her vaccinations. Lukas and Kobe are a bonded pair and weâ€™re looking for someone to adopt them together, and someone who is home a lot. Both are neutered and up to date on shots. Lukas is 7.5 years old and a very sweet puppy. He is shy with strangers but will be right by your side every second when youâ€™re with him. Lukas loves having his backside rubbed and will present it to you for the rubbing to begin. He loves to take rides and walks but he is shy with approaching children. He loves carrots as a treat. Kobe is 6.5 years old and is very outgoing. He is very friendly to children, other dogs and the right people. He will know if youâ€™re not a dog friendly person. He also will be right by your side throughout the day, loves rides, walks and the boat. He loves carrots as a treat as well. 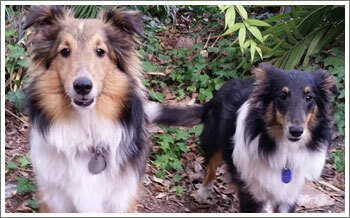 Marley and Murphy are a bonded pair of Shelties. 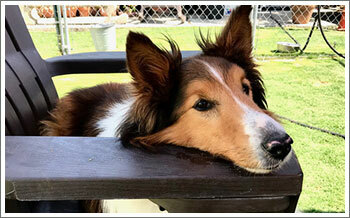 Marley is a tricolored, 6 year old, male Sheltie. While Murphy is a sable and white, 12 year old, male, although you would never know it based on how active and healthy he is! They are very social and outgoing dogs. Upon meeting them, be prepared to be greeted with happy faces and wagging tails. Get into a crouch position and expect to have 2 loving dogs run up to you excitedly and look to receive a back scratch or belly rub. 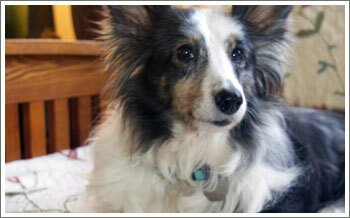 Lindsey is a 9 yr. old beautiful blue-merle sheltie female, with a pair of Blue eyes that just sparkle. 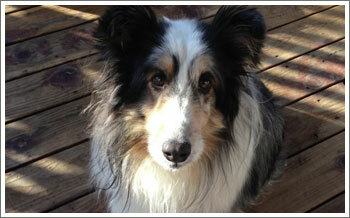 She is one of the sweetest friendliest Shelties her foster home has had the honor to have in her home. When Lindsey came in rescueâ€™s care she weighed 47 pounds. Her ideal weight should be about 24 pounds. Her previous owners (who could no longer care for her obviously just let her weight get way out of hand. Her front feet are turned in, but that doesnâ€™t hinder her at all. She is on a special diet to lose minimum 23 pounds. Our guess is that sheâ€™s already lost about 6 pounds. 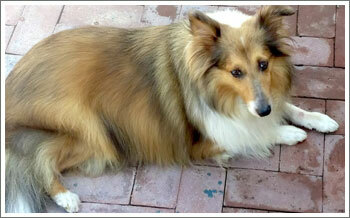 Lexi is a very sweet 7 and a half year old Sable and White Sheltie. She came to us recently from a home where there were two young children who didnâ€™t know how to treat dogs. Thus we are looking for a home for her with no small children. She is a bit shy but opens up as she gets to know you. Lexi is spayed and up to date on all her shots. Sheâ€™s a mellow Sheltie, and likes to go for walks. She likes to stay to herself, but doesnâ€™t mind if there are other dogs around. Lexi is a bit overweight at 38 pounds but with nutritious food and measured meals she will slim down nicely. Her goal weight would be about 28-30 pounds. Her thyroid is low and she is taking medication for that, which will also help with the weight loss. She just needs a home where she will be loved and doted on. Sheâ€™s a lovely Sheltie. Hi! My name is Lady and I am a tiny, 10-lb cuddle bug. I believe that the only good lap is a lap that has me in it! I am a happy, 2 Â½ year old whose owners had to move and couldnâ€™t take me with them. I am spayed, like car rides and walk really well on a leash. I havenâ€™t been around kitties so I donâ€™t know if I like them. I adore sleeping on your bed with you but will, grudgingly, sleep in a crate as long as you leave the door open. I will endlessly chase a tossed toy and bring it back to you but please donâ€™t squeak itâ€¦scares me a little bit and I will have to go find something else to do. If you are looking for furry lap warmer that lives to cuddle, snuggle and share whatever space you are in, have your people contact my people and letâ€™s get going! 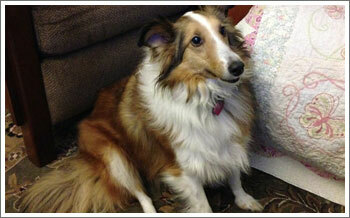 Lolly is a delightful, 4 years old, spayed female, tricolor Sheltie. She is fun and playful, ready for her forever home. Lolly lived most of her life as an only dog and loved being the center of attention. 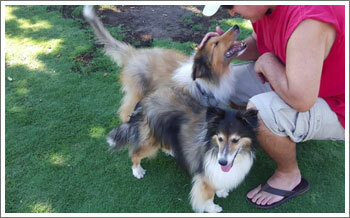 In rescue she gets along great with the other Shelties and has started to play with the pack. She has a few pounds to lose but is doing well eating measured meals. She is very happy and spins in circles when we come home. She loves to go for walks, rides in the car, snuggles on the couch and loves to play with her people. She gets along well with everyone. She would prefer a home with a yard (so she can potty in private.) 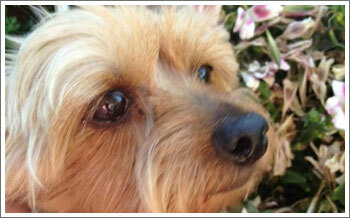 She has had regular veterinary care and is well socialized. She is spayed, up to date on vaccinations and has had some training. Rainbow Bridge - Forever Loved! 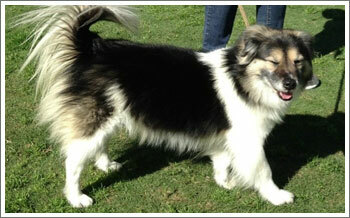 Pippa is a sweet, small, 5 years old, sable & white, female Sheltie. She is very timid and shy so needs a home that can help to bring her out of her shell. She loves food but needs to slow down a little. 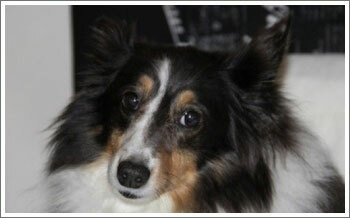 Laci is an affectionate, 8 years old, sable & white, female Sheltie. She loves to hang out with her people at home and enjoys greeting guests. On daily walks she has a good walking pace and has an outgoing personality. She can get a little excited when she sees other dogs on walks but redirects easily. Her outgoing personality can seem a little forward to other dogs in the household, so she would love to be an only dog and have her people all to herself. 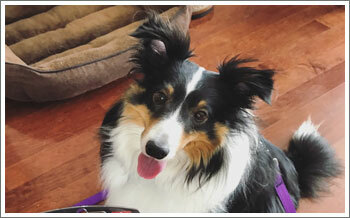 Laci needs her daily walks and measured meals to help her maintain a healthy weight. She has the drive to herd anything that moves fast so a home with no cats and children over 8 years old is preferred. 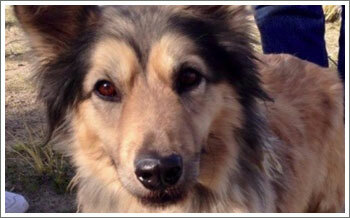 Laci is such a lovely girl and is ready to start her new adventure in a forever home. Roxanne is a 7yr. old sable and white Sheltie. She came from the shelter where her owners dropped her off saying they could no longer take care of her. She is a bit oversize. About 16 inches at the shoulder and weighing in at 40 lbs. She could stand to lose about 3 lbs. and we are working toward that goal. She is as sweet and happy as they come. Loves to be loved on, gets along with other dogs and all people. We don't know how she does with cats as she hasn't been around any since she came here. She can be very playful and on the other hand she likes to cuddle next to you. Her picture doesn't do her justice and we will try to post more pictures of her soon. 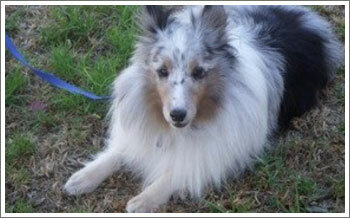 Romeo is a sable and white, male Sheltie with one blue eye and one brown eye. He loves to play and is friendly to people and other dogs. Romeo is always checking on Juliet to make sure she is okay and he enjoys her lively antics. He is smart, easy going and relaxed. Juliet is 6 years old, sable and white with a soft and luxurious coat. She loves to play with Romeo. She is very attentive and likes to be with her people, doing whatever the family is doing. She is a little grabby with food so is fed separately, she has a special food bowl that helps her slow down. Her boisterous personality is fun loving until she meets strangers and then she becomes shy. She is super smart and needs activity to keep her brain happy. She likes fast paced walks and will weave in front of you, to slow you down and protect you if a stranger approaches. 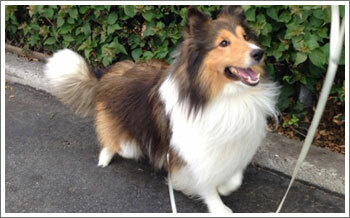 Alber is a sweet natured, 5 year old, tricolor, male Sheltie. He loves to play ball and go for walks. He likes his bed but loves to snuggle on the couch or in your bed. He is well trained and does tricks like sit, stand and spin. He is an excellent partner and good communicator. He likes to play with other well behaved Shelties but his favorite game is to play ball. His parents, Taffy and Zheke, also recently came through rescue but have been adopted. Alber is neutered, microchipped, up to date on his vaccinations and his birthday is July 27th, 2010. 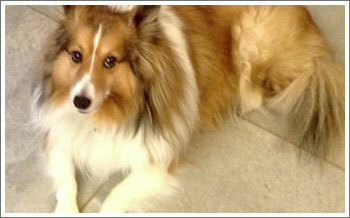 Skippy is 3 years old, sable & white, male Sheltie. He loves to bounce and play all day then snuggle at night. He plays with people, dogs, toys and loves everybody. He has a very curious nature and is super smart. So smart that he has already learned how to open the food bin. He didn't go for the food, he just wanted to learn how to open the container. He acts like a one year old, learning everything he can and has a zest for life. He plays hard then relaxes next to you like everything is good in the world. Skippy also submits to other dogs like a puppy, he plays and then rolls over to show them his tummy. He is learning manners and has that desire to please. He is very obedient and agile. Skippy is neutered, microchipped and up to date on his vaccinations. 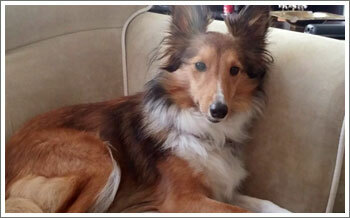 Chloe is an energetic, super smart, long legged, 2 years old, tricolor, spayed female Sheltie. She loves to bounce and play. She needs an experienced home that can give her plenty of exercise, socialization and obedience training. You can apply the "nothing is free" training technique or she will have you trained in no time. 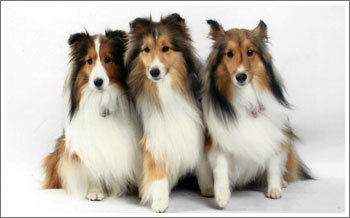 Who doesn't love being trained by their Sheltie? This is a once in a lifetime love as Chloe has so much to offer. She is such a character and will do great in a home that is active, lively and can keep up! This smart girl needs opportunities to engage her mind and learning experiences to expand her world view. Come on, get off the computer, she needs things to do, places to go! 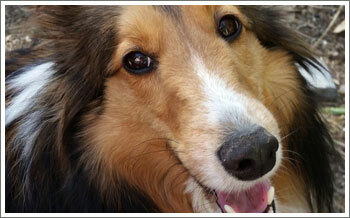 Beautiful Bellissima is one of the sweetest and most precious Shelties we have ever had the privilege to meet. She is easy going, loyal, friendly and well mannered. 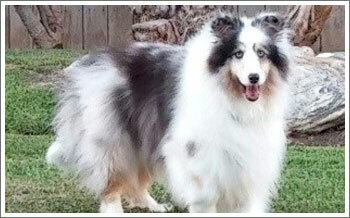 She is 9 years old, blue merle, spayed female Sheltie. Her birthdate is July 25th, 2005. She was about 40 lbs but she has been eating healthy food and taking gentle walks. We are working toward 35 lbs, which will be a good weight for her as she has some mobility issues and keeping her weight down will help her feel so much better. She is very loving, trusting and relaxed. She loves treats and snuggling. When we play, she perks up and is alert but is happy to sit back and watch. 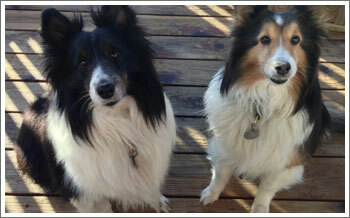 Taffy & Zheke are the most adorable bonded pair of Shelties. They are well mannered, lively, spry and have the cutest play sessions. Taffy's birthdate is June 3rd, 2004 so she is 10 years old. She is a sable & white, small, gorgeous girl. She loves to snuggle, lick and preen. She will lay at your feet but it is so much more fun when she snuggles on the couch. Zheke's birthdate is June 15th, 2008 so he is 6 years old. 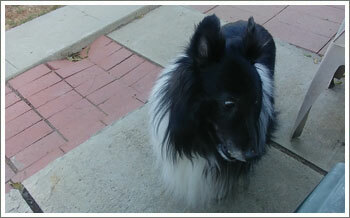 He is a small, tricolor sheltie, we thought he was a bi black until we noticed a small line of brown on his muzzle. He loves to play and get the pack going in daily running fits. He nudges your hand for attention and that makes Taffy jump in for love and pets too. Both are great on walks, like to go places and are good plate lickers. They make it really hard to go to work because they are so cute and fun to be with. 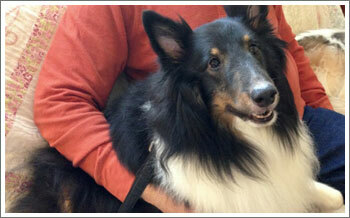 Buddy is a sweet outgoing 8 year old male Sheltie Mix. He's the perfect size at about 30 pounds and is just all around adorable. He's very calm and easy going; likes other dogs and loves people. Buddy loves to play chase with soccer and tennis balls and his favorite toy is the twisted rope. He knows the basic obedience commands - Sit, Down & Wait. He's a fast learner and is quickly picking up Stay, Leave It & Heel.He's happy to go anywhere with you - the park, for walks, and in the car. 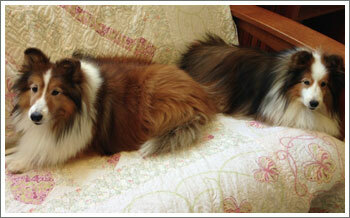 Moss and Haze are two gorgeous Sheltie brothers that came to in to rescue together with the Anza 6. There is not a place they go where people don't stop to admire them; people frequently ask to pet them, or inquire about them because of their looks and happy demeanor. They both are 5 year old males, tri-colored (Haze has dilute coloring in his coat), neutered and up to date on all their shots. They know basic commands, are completely house trained, very well behaved and very polite. Both are great around other well behaved dogs. They will do best in a home that will have the time to continue to work with them on their socialization and training, and give them the exercise they need on a daily basis. The rewards will be tremendous, and these dogs have shown they will bond with their owners and be very special companions. 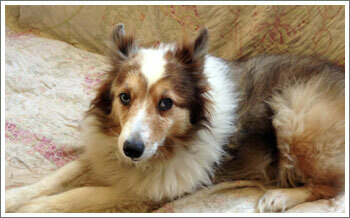 Eddie is a beautiful, very well mannered, 9 yr. old, male, sable and white Sheltie. He is deaf (although he does seem to hear some sounds). He is very friendly and loves attention especially belly rubs. He acts like he's 6 years old instead of 9. He was a stray and we picked him up at the Inland Empire (Pomona) shelter after his owners failed to claim him. Eddie is perfectly healthy other than having a low thyroid which he takes a pill for. He is neutered, and up to date on all his shots. His foster Mom has other dogs and he fits right in, playing with the others. He also loves people. I would like to introduce everyone to Suzanne - a little girl about ten years old who is blind and deaf. Her eyes are covered with cataracts and she hears very little but has so much to give to the right home. She walks very well on lead, seems to be totally house trained, has the loveliest face and the sweetest disposition. She is on thyroid medication and needs to lose a few pounds, but this does not stop her. She is adorable, so if you have a place in your home and your heart for this lovely little lady, please contact us and we will make arrangements to have you meet her. 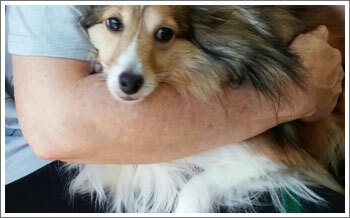 Olivia is a 2 year old, spayed female, sheltie mix. She is a sweet, happy little dog who gets the zoomies when you come home from a hard day at work. She calms quickly and will then find a quiet corner to lay down. At night she hangs out in her crate or under the bed. She behaves well in the car and on a leash. Occasionally, on a longer walk she gets tired puts on the "brakes", nothing will move her for a minute or so until she rests up. She is getting better with regular walks. She gets along well with other dogs and has had no accidents in the house. She's not protective of her food and doesn't take food from any of the other dogs. She can and will climb over a 3-4 foot gate/fence therefore a secure high fence is needed for her to be safe. She prefers to do her business while on a walk and would benefit from one every day. Ivy was adopted by her foster mommy who is fond of saying that Ivy was her first "foster fail". 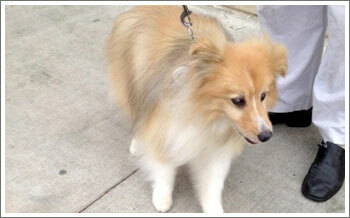 Ivy was one of the Riverside Shelties rescued from a property fire. She has come such a long way from the fearful, shy, and - very - sick little girl that came to rescue. Ivy still doesn't much like walking on a leash but she has turned into a playful, curious little ball of fur that ADORES her brother, Peanut. She is the light of our lives and we could not be more thankful for her addition to our family! Lily is a 9 year old spayed sable female and her bonded "brother," Jake is an 8 year old neutered tri-colored male. They are a bonded pair and do everything together. It is preferred for them to be adopted together. They are both oversized weighing in the upper 40 pounds. Approximately 17 inches to the shoulders. They are active, love to play with each other, chase and jump at squirrels and "outside" cats. They are fine with cats of your own as long as you introduce your cats as part of your pack, they will respect your cat as their family. They will follow you everywhere and love to take walks or jogs. Lily enjoys to play fetch with balls and tug of war with soft toys. Jake enjoys playing with Lily while she plays with a toy. They know many words including toy, go out, come inside, come, sit, kiss, shake, jump up, off, leave it, and stay. 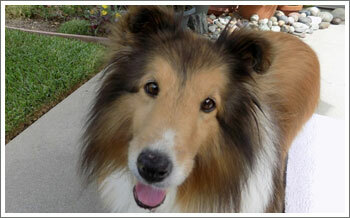 Jasper is a fun loving, 7 year old, tricolor, neutered male Shetland Sheepdog. He lives to play ball and loves to be by your side. Jasper needs a home where he can be your partner. 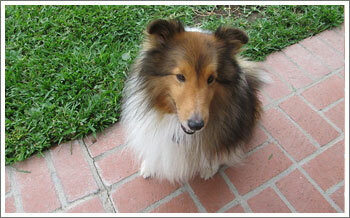 He has those great Sheltie qualities of being super smart and willing to please. His previous family loved him very much but with work schedules and since having a baby, they couldn't keep up with the level of care they wanted to provide for him. Jasper loved the baby but needed more exercise and social activities. Jasper has a dominant streak and likes to herd everything. He would love to try sheepherding and has been obedience trained. He is very alert and has excellent hearing. Jasper loves to play with other dogs but might prefer to be someone's special one and only best friend. Shelby is a cheerful, 9 year old, neutered male who is also a master of the tummy rub (receiving, not giving). He loves people. In fact, he LIVES for people. He is a big guy for a Sheltie, about 45 pounds. He cuts quite a figure, with his flame-red coat and the little white heart marking on his forehead! Shelby adores walks and needs a home that will provide them. He came to rescue overweight, he is now lighter and cantering around. He still has to watch his figure but this is easy with consistent daily exercise. Luckily he loves walks! In fact, anything he can do with his person or people will be fine with him. He is a good match for a couple or a single, for an apartment or a house. Shelby truly adores people, but does not prefer the company of other dogs. He needs a home where he can be your one and only. 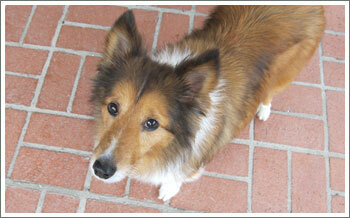 Tina is a precious, small size, 9 yrs young, tricolored, spayed female Sheltie. How does so much goodness come in small packages. 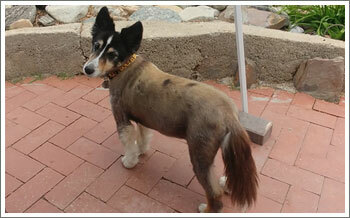 Tina was previously shaved but her coat is growing back nicely and the fluffy look is very endearing. When her coat comes back it will be beautiful and elegant. She does have some arthritis but she gets around pretty good. She just hesitates before going up long staircases and we think that she was taught not to jump on furniture. Her previous owner passed away last week, so she has been through a lot recently. In spite of her devastating loss, she is loving and appreciates being loved and cherished in return. Nelson is a six year old tri-color Sheltie mix, weighs about 15 pounds, is very sweet and affectionate, will give kisses and leave paw prints on your heart. He is very energetic and playful, loves to play fetch with squeaky toys, run around the back yard and go on walks in the neighborhood. He does very well on a leash. Nelson is afraid of other animals so he must be the only dog in your life. When Nelson was rescued he was scared and confused, but since working with a trainer, he has made great progress in overcoming his fears. He does not understand young children but is fine with adults. He is ready for his forever home, will give you kisses and be a great addition to your home. 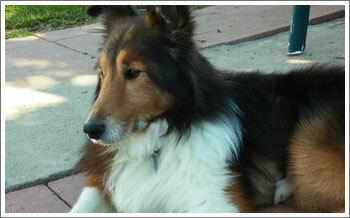 Marley is a friendly, oversize, 9 yrs young, neutered male, sable and white Sheltie. He loves to play ball, chase lights and go places. He has the cutest freckles on his nose and legs. His favorite place to sleep is on the bed by your side, it is amazing how small he can make himself to fit between people on the bed or couch, he just folds up his long legs and he can fit anywhere. His favorite activities are whatever you are doing. He is very obedient, athletic and agile. He likes to chase things that move fast or make loud noises with good ol' fashioned Sheltie style. He also likes to perch in the front doorway and watch the world go by, of course, giving suspicious people and trash trucks the barking treatment. 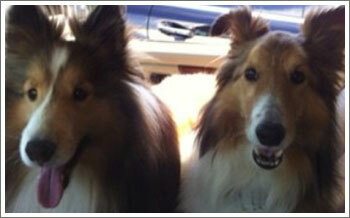 61 Shelties were safely rescued from a home when a house fire broke out. Emergency Services called the Riverside Department of Animal Services to help with the large number of dogs at the site. 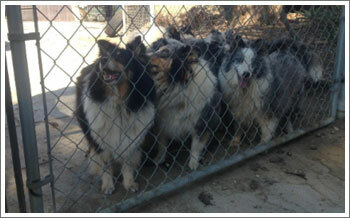 The breeder released the Shelties to the Department of Animal Services who worked tirelessly with the community and many rescues to place the Shelties into loving homes. Sadly, some were lost. Happily, most were not and were adopted by loving families who opened their homes and their hearts to these lovely dogs. 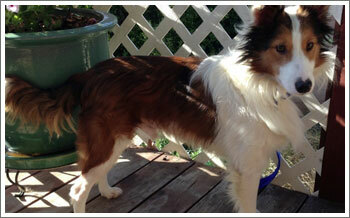 Cannoli is an adorable, 3yrs old, sable and white, spayed female Sheltie. She loves to be with her family and will do anything for treats. She is well trained and socialized but needs to take regular walks and have measured meals. She knows many obedience commands and plays games like chase, keep away and bark-at-a-stranger. She had a problem with the children in her previous home as they got scared if she tried to herd or correct their behavior. She is good with other dogs but does have a herding instinct that can be overwhelming to smaller dogs. She likes cats that do not taunt her. It is just too irresistible to engage if they give chase. 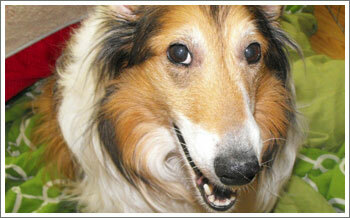 She is so darling and happy that her amazing Sheltie traits will certainly be appreciated in the right Sheltie home. 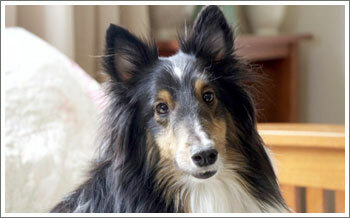 Waldo is one of the Riverside Shelties that was rescued from a fire last summer. This cute little Blue Merle male looks and acts like a puppy. He is only 15 pounds and approximately 12 inches at the shoulder. He would not walk on a leash when we first received him. Now he enjoys and walks proudly as any happy dog would on a leash. He was fearful of humans and now he is learning to trust that humans are OK. He is still a bit shy and aloof, but is gaining confidence each day. He enjoys playing with toys and you don't have to worry about putting them away at night because he will bring them all to his bed. Waldo is very energetic and likes to be with other dogs. He is also fine with cats. Penny and Parker are approximately one year old siblings. 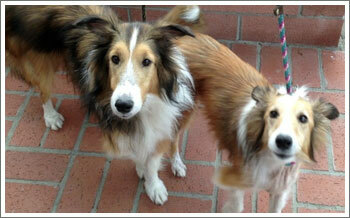 They are honorary Shelties that are on the small size and need to find a home together. Penny is a female that is all white and weighs 11 1/2 lbs. Parker is a male with some sable markings that weighs 12 1/2 lbs. They were found wandering the streets together in an area that is a coyote environment. They are loving and playful with their people and each other. They get along with other dogs and just love to have fun. They are not leash trained so whoever may be interested in adopting them will need to have patience and work on this. They are spayed/neutered and up to date on their shots. Both are very friendly and happy pups. 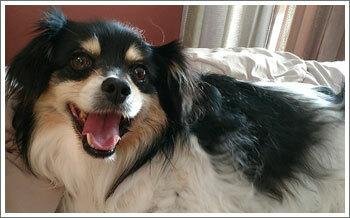 Tux is a very happy and friendly little sheltie papillion mix. He's an extremely gorgeous combination of the two breeds. He is 4 years old and weighs about 10 lbs. 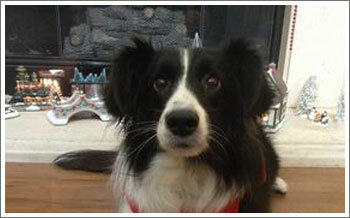 Tux loves to walk, run, play and he loves his people; he is extremely affectionate and sweet. You want endless love in a small fluffy package? This is your guy! 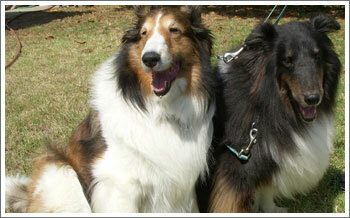 Connor and Sprite are 10 yrs young, sable & white, spayed/neutered Sheltie siblings. They have been together their whole lives and are best friends. They came from a home that was moving and could not keep them. They get along with well behaved children but would prefer older or no children in their forever home. We are not sure about how they would react to cats. They have had their medical check ups and had their teeth cleaned recently. Sprite had a fatty tumor removed that was under her arm. They are so darling, they love to sit on the couch and hang out with their people. They walk well on their leashes and are very well behaved. This beautiful little lady named Nala is looking for a new home. She came from her original owners and is in great health - teeth cleaned, shots current - and she walks on lead nicely. She was threatened by a large dog once so is shy around other dogs, does not like ladders, vacuums or loud noises. She has fun with sprinklers, will bark at them and try to bite the water. Nala is fourteen inches high, weighs about 25 pounds, is ten years old, a people dog, loves to cuddle and sleeps on the floor beside their bed. She is currently on the Banfield Wellness Plan and this will be transferred to the new owners. Her current family is looking for someone to spend more time with Nala as both adults work full time and she spends part of the day in a side yard.